Airbnb is an international hospitality service that helps guests access unique homes, experiences, and places around the world. Help families access parent-centered services through their booking with Airbnb. Solo project. Conducted user research and created a mid-fidelity mobile app solution. Airbnb does not currently offer parent-oriented services and amenities for vacationing families. Therefore, it can be difficult for parents to fully relax and spend quality time together when the children are young and require supervision. How might we make Airbnb more parent-friendly for families traveling for leisure with their young children so that we may increase bookings by this demographic? At the outset, both the problem and the user persona were undefined, so I leaned on a basic proto-persona to guide my research. User interviews were conducted with 2 male individuals who matched the approximate age and marital status of the proto-persona. While I was looking for overlapping pain points in married users with and without children, it became clear during user interviews that having children contributed to another set of challenges. For both users, it was hard to make time to take a vacation, but for parents, taking care of the kids was a job in itself. • The user wanted for both him and his wife to have a restful vacation. • Vacation was less restful when there were children to take care of. 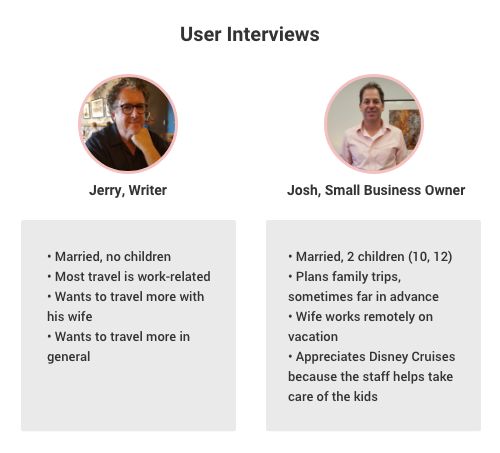 Moving forward, I decided to focus on the user with children and explore how Airbnb could help him plan and book a more relaxing vacation with his wife and two kids. 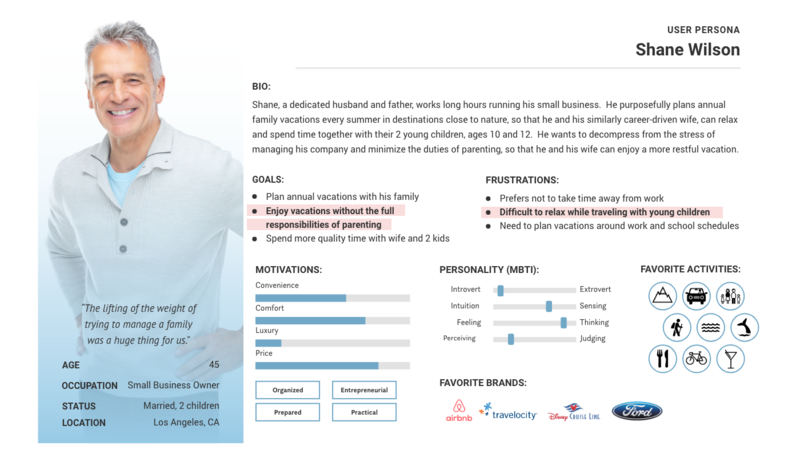 A competitor analysis was conducted to learn about the parent-centered amenities being offered by other businesses in the hospitality industry. How were they appealing to parents traveling with young children? How did they help with family management? A closer look at Airbnb’s competitors revealed a spectrum of parent-centered experiences that Airbnb was missing out on. Competitor Analysis: Airbnb could offer more family-centered services to help parents with kids. Disney Cruise Line and Princess Cruises are the strongest INDIRECT competitors and have the greatest competitive edge. By offering activities, entertainment, designated spaces, and childcare services, the cruise lines offer parents the option to spend time together as a family and/or achieve one-on-one time without the kids. "The lifting of the weight of trying to manage a family was a huge thing for us." Key words and phrases from user interviews were sorted into an affinity diagram based on recurring conversation topics. This process was helpful in formulating user insights and potential design solutions. Affinity Diagram: Categorizing recurring conversation topics. A "I Like...I Wish...What If..." brainstorming activity was conducted to explore a broad range of possible solutions that would resonate with the user based on his pain points, needs, and goals. This exercise was instrumental in translating data and empathy into an innovative, user-centered design. Brainstorming: Considering a broad range of possible solutions based on the user. The ideas were narrowed down to a three possible solutions which included childcare services, more testimonials by parents, and more kid-friendly features. Childcare services stood out as a solution with the most direct opportunity for the user and his wife to relax. Introducing a service that offers accommodations that come with a qualified au pair who is highly reviewed and can be trusted to provide on-site childcare support. Incentivizing families with young children to plan their trips with Airbnb knowing that their kids will be safe, supervised and entertained. Meanwhile, parents will be able to take a break from both work and parenting. Au pair programs offer individuals the opportunity to live in the U.S. in exchange for childcare services. They are integrated into a host family and demonstrate a genuine interest in caring for children. Additional Research: Au Pair Programs are popular around the world. 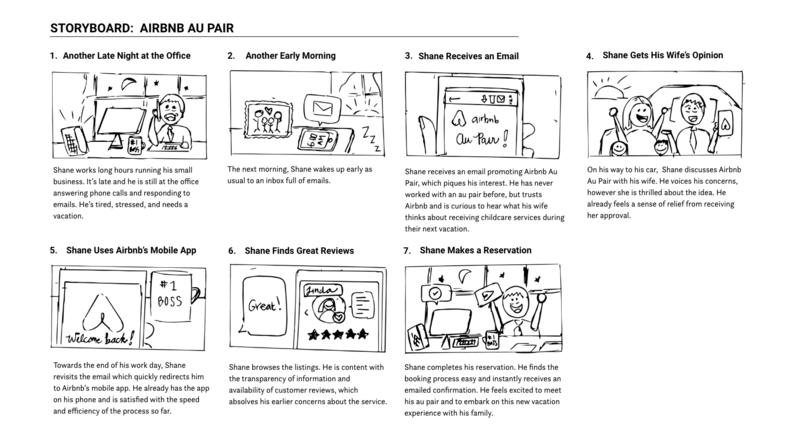 The user's experience with Airbnb Au Pair was visualized with a storyboard to show real world context. It was assumed that the user had already used Airbnb before and trusted the brand to deliver a quality service. Storyboard: The user discovers Airbnb Au Pair and recognizes a solution to his problem. 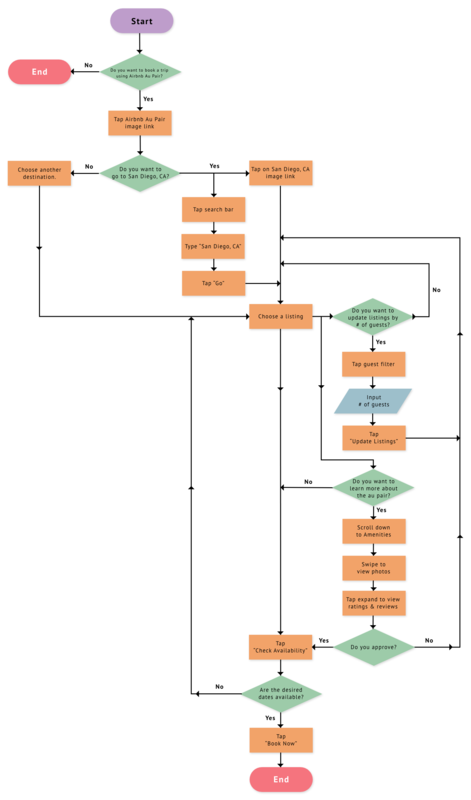 Consistent with the ux scenario, the user flow focuses on the mobile experience. The goal was to build the prototype with a minimal number of screens, while still allowing the user the freedom to filter his search criteria. Low-fidelity wireframes were sketched and user tested in InVision with 3 users. The goal was to quickly validate the solution concept, clarity of components, and ease of use. User Testing: Users were unsure which information was the most important. In the next iteration, a mid-fidelity prototype was digitized with changes suggested through user feedback. One more round of user testing revealed that the au pair and the home were competing for the user's attention on the Listing screen. In order for the service to be more parent-centered, it was important for the user to learn about the au pair first and the home second. User Testing: In order for the service to be more parent-centered, the user must learn about the au pair first. TASK: USING AIRBNB AU PAIR, MAKE A RESERVATION IN SAN DIEGO, CA FROM SEPT 18-22. Talk to more users. While speaking with both users was helpful and informative, only one had young children. If given more time, I would interview 4-5 more users with young children to better identify common pain points within their travel experiences. More user testing. The user testing I conducted was more to learn about functionality. The prototype would need to be tested with more target users to determine if the feature proves useful and desirable to that demographic. Add another user persona: Married, career-oriented women in their 40's with young children. Although the persona is a married man in his 40's, this project quickly turned into a service for families. I would be interested in doing more user research on working women to determine if their family vacation goals and pain points align with those of their husbands.